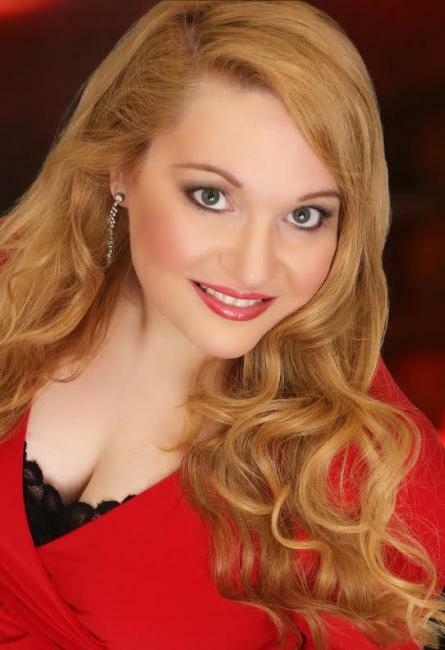 Angela Jajko, mezzo-soprano, has been praised in such publications as the Boston Globe and the Herald for her "peaches and cream" voice and dramatic delivery. A popular performer of opera, operetta, musical theatre, and oratorio, her recent performances have included acclaimed appearances as Ruth in The Pirates of Penzance with Greater Worcester Opera, in "I Love...What's His Name? ", a new cabaret of musical theater songs at The Arctic Playhouse; "A Complete Introduction to Opera (Abridged)", an original show she created with composer Dan Shore for the Outside the Box Festival in Boston presenting a comic take on the best loved music of famous operas; with Força Vocal Ensemble in the Final Fantasy VX Soundtrack and Trailer (watch it here); in Suor Angelica with Piccola Opera; in Boston Symphony Hall with the Zelda: Symphony of the Goddesses ensemble; as a featured soloist on the national radio show Says You! with the New England Gilbert & Sullivan Society Ensemble; with Opera Providence in The Romany Maid; as a featured soloist with Cape Symphony in "Passport to England" in the Barnstable Performing Arts Center; as a featured soloist in Longwood Opera's New Year's Eve concert; as the alto soloist in Handel's Messiah with Maplewind Arts;, as the alto soloist in Mozart's Requiem with Boston Cecilia at All Saints Brookline; and in the role of Prinz Orlofsky in Die Fledermaus with the North End Music and Performing Arts Center Opera Project in Faneuil Hall. Angela has also appeared as Miss Hannigan in Annie with Crescendo Theatre Company, The Lady of the Lake in Spamalot at Theatre at the Mount, selections from Carmen in The Greater Worcester Opera Gala in Mechanics Hall, Tessa in The Gondoliers with The Sudbury Savoyards, Orlofsky in Die Fledermaus with New England Light Opera, Carmen with Greater Worcester Opera, Offenbach’s Island of Tulipatan with New England Light Opera, the roles of Ruth, Buttercup, Phoebe, Katisha, and The Fairy Queen in concert with the New England Gilbert & Sullivan Society, and as a featured soloist in concerts with Opera on Tap, Masstheatrica, FIRSTMusic, Ocean Park Festival Chorus, Parish Center for the Arts and New Hampshire Opera Theatre. Angela's performances have included the roles of Carmen, Theodorine, Augusta, Marcellina, Hermia, Savitri, Pirate Jenny, and La Zia Principessa. She has also performed with Nashua Choral Society, Odyssey Opera, PORTopera, Granite State Opera, Longwood Opera, BASOTI, Harvard University, and the International Lyric Academy in Viterbo, Italy. She has been honored by the American Prize competition and holds degrees in Vocal Performance from The New England Conservatory of Music and the University of California at Los Angeles.